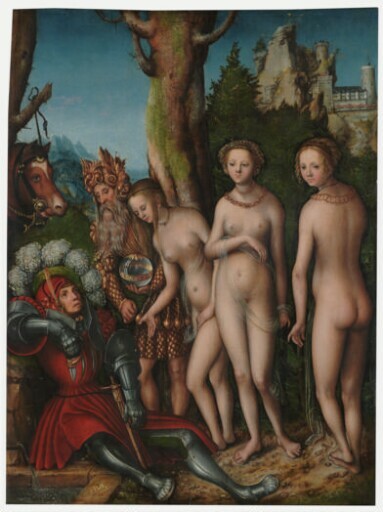 This is the first of Cranach’s several versions of The Judgment of Paris. According to Greek and Roman mythology, the goddess of discord tossed an apple labeled “to the fairest” among the Olympian gods. Jupiter sent the messenger-god Mercury to tell Paris, prince of Troy, to award the prize. The three goddesses who claimed the apple offered bribes. Juno promised wealth and power, Minerva military prowess, and Venus the love of the most beautiful woman on earth. Paris’s choice of Venus, and his abduction of the most beautiful woman––the Spartan queen, Helen––led to the Trojan War. Cranach’s portrayal of this subject was influenced by Guido delle Colonne’s Historia Destructionis Troiae, a fanciful medieval narrative of the Trojan War. This describes Paris tethering his horse and falling asleep after losing his way in a hunting expedition, at which Mercury appears in his dream and presents the three goddesses. In his painting the artist teases Paris––as well as the viewer––with an agonizing choice: the goddesses are nearly indistinguishable, and equally enticing. Cranach was one of the foremost artists of sixteenth-century Germany. From 1505, he spent almost his entire career in Wittenberg as the court artist to Frederick the Wise and his successors, the electors of Saxony. He was a close friend of Martin Luther, of whom he created numerous portraits. purchased through (Adam Williams, New York) by Kimbell Art Foundation, Fort Worth, 2004.